LOS ANGELES, CA-- SG Blocks, Inc. (NASDAQ: SGBX), a leading designer, innovator and fabricator of container-based structures, today announced that Paul Galvin, Chairman and CEO of SG Blocks, and Kathy Ireland, Chairman Emeritus and Chief Brand Strategist of Level Brands, will provide tours of the nearly 24,000 square-foot community arts and recreation center that is in the process of being constructed in Los Angeles. 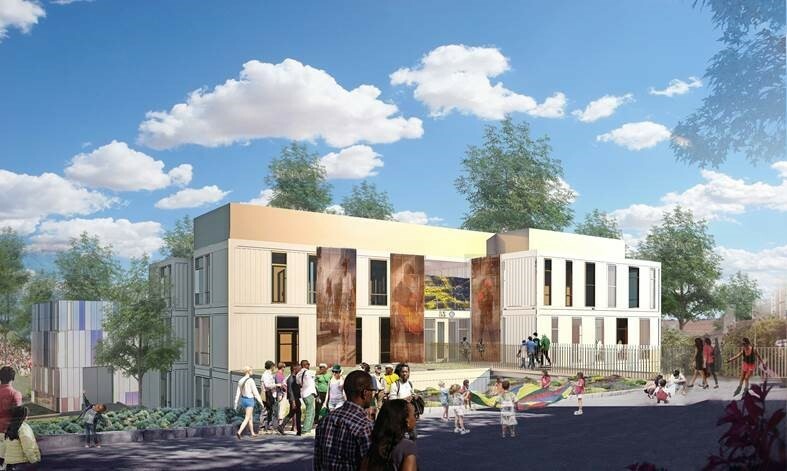 SG Blocks is collaborating on the three-story Heart of Los Angeles (HOLA) center, at 625 S. Lafayette Park Place. The firm has been engaged to design, build and deliver the facility, utilizing 46 modified shipping containers and four steel-frame modular units. Founded nearly 30 years ago, HOLA offers underserved children exceptional programs in arts, academics and athletics in a nurturing environment. The organization currently serves more than 2,300 children and families and this project will expand its capacity by 74 percent. There are 300 families presently on the waiting list and they will be serviced once the center is open. The containers began arriving onsite on March 26, 2018 with full delivery taking three to four weeks, and the center set to open by Summer 2018. Hardhats and necessary gear will be provided on-site, though SG Blocks recommends wearing sneakers or similarly capable footwear. To schedule a facility tour, please email your time request to chris.tyson@mzgroup.us or call Chris Tyson at (949) 491-8235. Available facility tour windows below.